Browse Dollar General Black Friday 2018 Ad: $35.00 Sky Rider Drone; $15.00 Smart Watch; Buy 1, Get 1 Free McCafé Coffee K-Cups 12 ct. or Premium Roast 12 oz. bag or Maxwell House House Blend K-Cups 12 ct.; $34.00 Sylvania 7 in. Portable DVD Player; $12.00 Toastmaster Slow Cooker With Locking Lid or Digital Coffee Maker; $5.00 Puffer Vest Ladies Or Men’s Sizes M-3x Or Ladies’ Sherpa Boots; $15.00 Stainless Steel Cookware Set; $15.00 Dirt Devil Stick Vac; $10.00 Toastmaster Electric Skillet with Lid, Personal Blender or Licensed Waffle Maker; $15.00 Sylvania Hi-Fi Speaker; $15.00 Billboard Electronics Speaker; $7.50 Axe, Dove, Caress, Dial, Tone or Old Spice Gift Sets; $20.00 Faux Fur Saucer Chair; $20.00 Large Standing Moose; 50% Off Plush or Fleece Throws; $25.00 Large Standing Santa; $2.25 DG hardware 9 ft. Extension Cord; Buy 1, Get 1 75% Off Toys; and more. 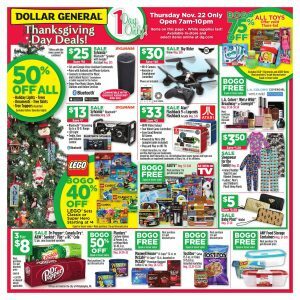 Find all deals and offers in the Dollar General Black Friday 2018 Sale Ad for your local store.